A look at the Tory reshuffle as it happened.. The PM started her premiership nigh untouchable, but today is her 3rd Reshuffle since July 2016. CONFIRMED: Justine GREENING quits the cabinet, saying she was “disappointed” by the appointment to DWP. She was moved from Education. CONFIRMED: Boris JOHNSON, Amber RUDD, David DAVIS, Gavin WILLIAMSON and Philip HAMMOND keep jobs. The expected appointment of a “No Deal Minister” diminishes DD’s power significantly..
Liam FOX keeps job as International Trade Tsar, a job which has little responsibilities as yet.. CONFIRMED: James BROKENSHIRE to resign from Northern Ireland Secretary citing poor health. Also CONFIRMED: Karen BRADLEY to replace him. CONFIRMED: Helen GRANT, Maria CAULFIELD, Rehman CHISHTI, Ben BRADLEY, Marcus JONES, Andrew JONES and Chris SKIDMORE join Kemi BADENOCH as Tory Vice Chairmen, watch as TM appears outside No.10 with team. The poor Conservative showing in the 2017 General Election has weakened her near beyond repair, with near unanimous acknowledgement by Tory MPs she won’t lead the party into GE2022. It’s expected May will bring in a “Cabinet Minister for no deal”. The new minister will be part of DExEU, alongside David DAVIS, the Brexit Secretary. Whilst not a Secretary of State, they will attend Cabinet meetings and control a significant budget. The appointment is an attempt to prove to the EU Commission and EU Parliament that Britain is prepared to walk away if the negotiations go south. We’re getting rumours it could be Steve BAKER for “No Deal Minister”. 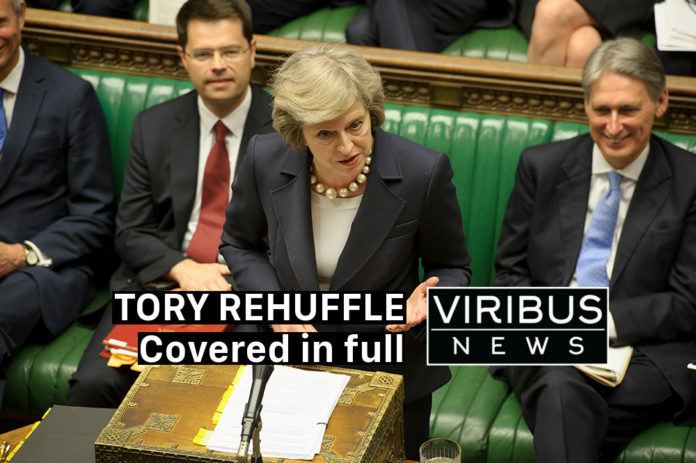 We are covering the Reshuffle as it happens and will update this page. Refresh! It’s expected the senior team, including Philip Hammond, Boris Johnson, Amber Rudd, Gavin Williamson and David Davis are all to stay put. Cover image Credit – UK Parliament – Shared under CC BY-NC 2.0 – Edited to add text and logo only.